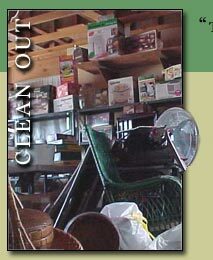 Cleaning out an attic, basement, shed or a whole house is a time consuming and overwhelming task for most people. It can be difficult or impossible to take the needed time away from work or family. The work can be physically and emotionally demanding. If the owner does not know the market value of the items present, valuable items are often discarded or sold too cheaply in a hastily arranged garage sale. Before a house can be sold, the broker will need the property to be emptied and cleaned, so that it can be shown to prospective buyers. This adds a degree of time pressure to an already confusing situation. Sometimes, the contents of a home are inherited by a family member who wishes to keep everything. But, because of time or physical constraints, the person is unable to remove and transport them without assistance. Sorting of items for liquidation. Some items may be best suited to sale at auction, or through an on-site sale. Location of personal papers, legal documents, and financial records, and delivery to the person designated to receive them (attorney, executor, trustee, etc.). Removal and disposal of trash. Packing and removal of items to storage. Arrangement for shipping of items to absentee owners and heirs. Identification of specific items designated to an heir in a deceased persons will or living trust. Often, a person will leave instructions that their a friend or family member is to receive a particular piece of furniture or pottery. The executor may not know what a Roseville Poppy Vase looks like, but we do! We can help you assure that the persons wishes are met. We are always willing to add new services to the list if you dont see them listed here.